Here’s a cool military dive watch collaborative project - Haigh & Hastings and the Australian 1st Military Police Battalion have teamed up to make a special edition of the M2 DIVER. The 1st Military Police Battalion perform a key role by providing deployable Military Police elements and policing services to the Australian Army. 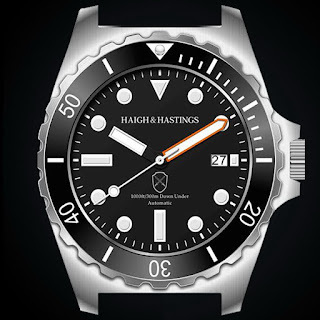 features: a scratch‑resistant Sapphire crystal, a 7mm screw-down crown and caseback, a unidirectional divers bezel in either black or olive, highly legible markers and is water-resistant rating of 300 meters. SuperLumiNova has been used on all hands and hour markers. Providing accurate time is a Japanese SEIKO NH35A automatic mechanical movement with: a quick-set date, hacking seconds, manual winding and with a power-reserve of 40 hrs. 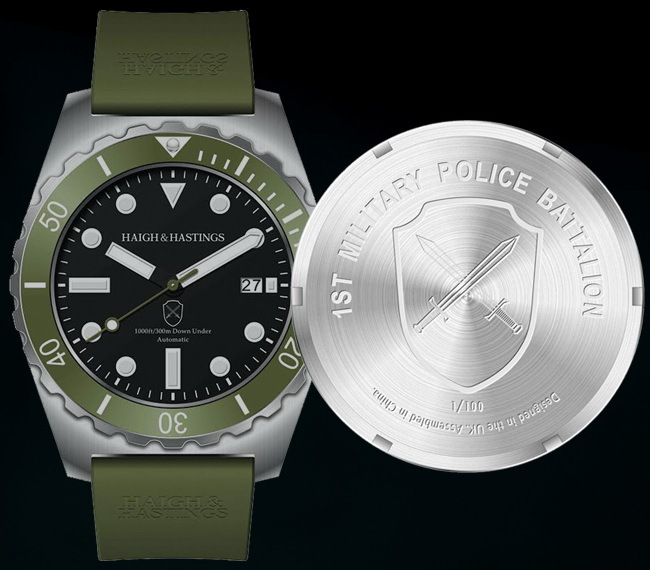 The M2 Lifestyle Watch for the Australian 1st Military Police Battalion comes on a 22mm Italian natural Italian rubber divers strap and is available for pre-order – HERE.